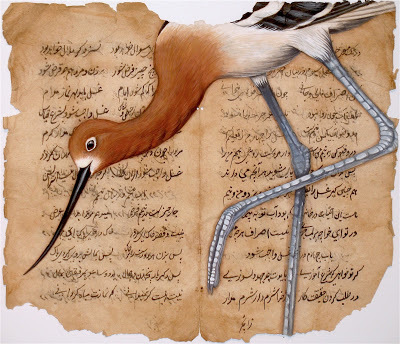 Peaceable Kingdom features works created utilizing the conventions of classic natural science illustration to represent familiar inhabitants of the Northwest rendered in gouache on found Arabic manuscripts inspired by the classical painting tradition of Persian miniatures. Justin Gibbens received his BA in painting and drawing from Central Washington University in 1998 and a Scientific Illustration Certificate from University of Washington in 2003. Thirty-some odd years ago when he first began moving graphite on paper he was rendering the boyhood standards: dinosaurs, creepy crawlers and other freakish fauna. Not much has changed in three decades. Justin credits his work to countless hours spent watching David Attenborough documentaries, innumerable trips to natural history museums, and above all, a keen and unhealthy interest in all things that scamper and poke about in the undergrowth, slither in the thickets, soar through the ether and swim in the infinite abyss of our planet’s aquatic environments.